commented on "A lot of people suffer unnecessarily from varying degrees of back pain. In my experience as a yoga practitioner, teacher and naturopath, ..."
Lack of flexibility through the back of the legs: this is common in people that experience back pain. When the muscles, tendons and ligaments are tight through the back of the legs, the back compensates for it, creating unfavourable postural tendencies throughout the spine. It is more difficult to lengthen up effortlessly through the spine in a seated posistion, which leads on to the next contributing factor to back pain. Lack of space and poor cushioning between the vertebrae of the spine: when there is poor posture and poor muscle tone plus the effects of gravity, the vertebrae compress down on the discs between the vertebrae that are designed to cushion and protect the vertebrae themselves as well as the multitude of nerves that radiate from the spine. If this compression is continual over a long period of time, eventually the health and function of the discs and vertebrae is compromised due to wear and tear. When the vertebrae compress nerves, pain is experienced and the muscles tighten around the area of pain as a protective reaction. However, the constriction of the muscles can lead to muscle pain and a tendency to develope "knots" in the muscle tissue, which can cause on-going pain locally and also referred pain to other areas of the body away from the original trauma site. Inflammation also starts to occur around the area of pain. This is the defence mechanism kicking into action at a site of trauma, but if the cause of the pain continues, the inflammation doesn't naturally subside, which causes more pain to be created from an excessive, on-going inflammatory process. Mineral deficiencies: a good balance of minerals is required in the body for proper functioning of the body tissues. Magnesium deficiency in particular can be a key factor in muscle pain because magnesium aids relaxation of the muscles. And because there are many things that are common in modern-day living which deplete magnesium in the body, a magnesium deficiency can very easily become a key contributor to back pain. Stress: creates constriction of blood vessels, tightening of muscles and general tension in the body. Many people live in a state of almost continual mediocre stress which they have become so accustomed to, to the point of not even being aware of it. Stress not only creates physical responses in the body that contribute to pain, but it also depletes the body of much needed minerals such as magnesium, and anti-inflammatory vitamins. And substances are quite often used to try to combat the effects of stress, such as coffee, alcohol, drugs and poor food habits, which actually only exacerbate the stress response in the body and deplete the body even further of much needed minerals and vitamins. Poor abdominal muscle tone and excess abdominal fat: this can contribute to back pain by not providing core strength and support to the back, and by creating an imbalanced 'centre of gravity weight distribution' towards the front of the body, creating over-strain of the back muscles to counter-act the imbalance. Yoga- is great for creating and maintaining space between the vertebrae of the spine and for strengthening and toning the muscles. 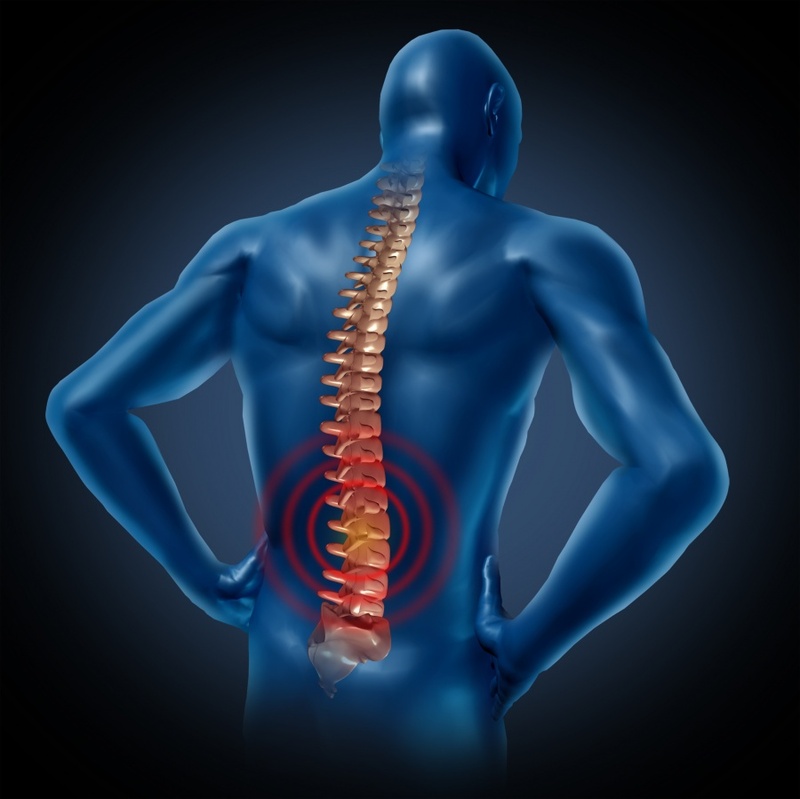 Lengthening through the spine reduces compression of the vertebrae on the discs and spinal nerves and therefore reduces wear and tear on them, which in turn helps with pain reduction and improves the body's ability to maintain healthy, plump discs which properly fulfil their intended function of cushioning and protection. The strengthening of the muscles through yoga, helps support the spine and improves postural alignment. The flexibility and strength created through on-going yoga practice also reduces the likelihood of injury, and therefore reactive trauma and inflammation. Yoga also promotes awareness of the body, and relaxation and open energy flow, to help reduce and prevent back pain. Ensure the body is getting adequate minerals and antioxidants - eat a healthy, varied, whole food, predominantly plant-based, diet. A heavily animal-based diet can exacerbate inflammation in the body as it increases arachidonic acid which is a key contributor to the inflammatory cascade. It may be necessary to replenish the body's mineral stores, particularly if the diet is poor. But even if a healthy diet is being adhered to, many of the soils that commercial crops are grown in are lacking in a naturally healthy balance of minerals, which creates food that is deficient in minerals, and therefore people that are deficient in minerals. CMD (concentrated mineral drops) is recommended for providing the body with a broad range of easily assimilated minerals. Or if you suspect you may be lacking in magnesium (check out signs of magnesium deficiency ), Elemental Magnesium is recommended as it contains a high level of ionic-form, bio-available magnesium along with a broad range of other minerals. The tissue salt Mag.Phos is also recommended to ensure good absorption and balance of magnesium in the body tissues, and Calc.Fluor tissue salt for flexibility and elasticity of tendons and ligaments, and Ferr.Phos tissue salt to help in reducing inflammation. Good sources of antioxidants are fresh fruits and vegetables, and herbs and spices. Tumeric is a particularly good anti-inflammatory that can be added liberally to food. Or for a more potent anti-oxidant effect, Berry Radical. Avoid things that deplete the body of vitamins and minerals - such as stress, caffeine, alcohol, tobacco, drugs, sugar and pharmaceutical medications. Relaxation - massage, yoga and meditation can all help to reduce stress and promote greater relaxation throughout the body. Massage helps in releasing built-up muscle tension, dispersing "knots" in tight muscle bands and promoting good energy flow throughout the body. If your lifestyle is fast paced and stressful, it is important to take time out for relaxation and to try to do tasks in a more relaxed manner through awareness and altering perspectives and reactive tendencies. Avoid drinking coffee as it perpetuates the stress response and makes it very difficult to relax. If you have difficulty relaxing it may be necessary to take some relaxing herbs, drink relaxing herb teas, or take a herbal supplemnet for relaxation. Also you can read the Relaxation - So Important for Well-being news article. Practise body awareness - 'scan' your body regularly by simply moving your awareness into the body rather than the external world. This makes you more likely to become aware of any tension you may be holding in particular areas of the body. Once you become aware of it, it is a lot easier to relax and let the tension go. Reflexology - can be applied to the spinal area of the feet and hands. Adequate exercise - improves stress reduction, maintains muscle tone, improves circulation, and prevents the body from being in one position for too long which can place pro-longed stress on particular muscle groups, yet no activation of other muscle groups. Ensure that any exercise done is done with total awareness and only to a level that is comfortable. Maintain good adrenal function - the adrenals produce cortisol which plays a "dampening down" role in the inflammatory reaction. When there is poor adrenal function, adrenal hormones may be reduced and the inflammatory response can burn out of control. Drink plenty of water - maintaining hydration improves circulation and nutrient transportation to all body tissues, and removal of toxins and waste away from body tissues, thereby improving not only the structure of the tissues, but also the function. So, now that you understand more about the factors that can contribute to back pain and the different measures that can be taken to prevent it's occurrance, it's just a matter of putting it into practice.